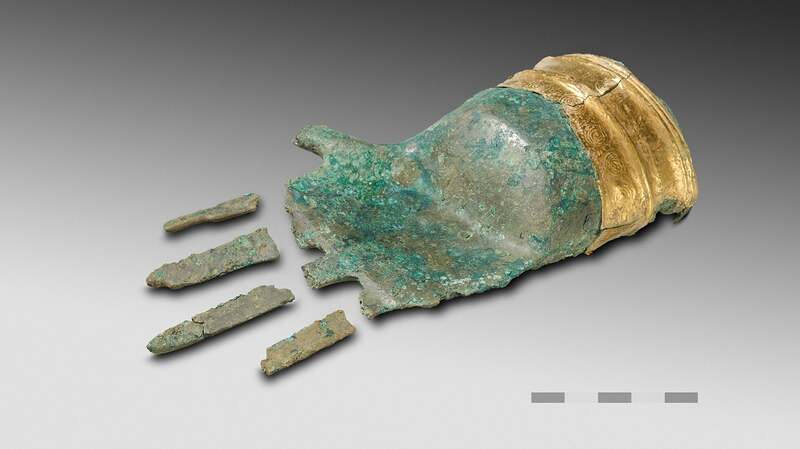 In October 2017, a pair of treasure-hunting metal detectorists made an extraordinary discovery near a Swiss lake: A sculpted bronze hand with a gold cuff dating back some 3500 years. Archaeologists have never seen anything quite like it, and are at a loss to explain its purpose or function. And in an unfortunate turn, the hand is now at the centre of a criminal investigation. 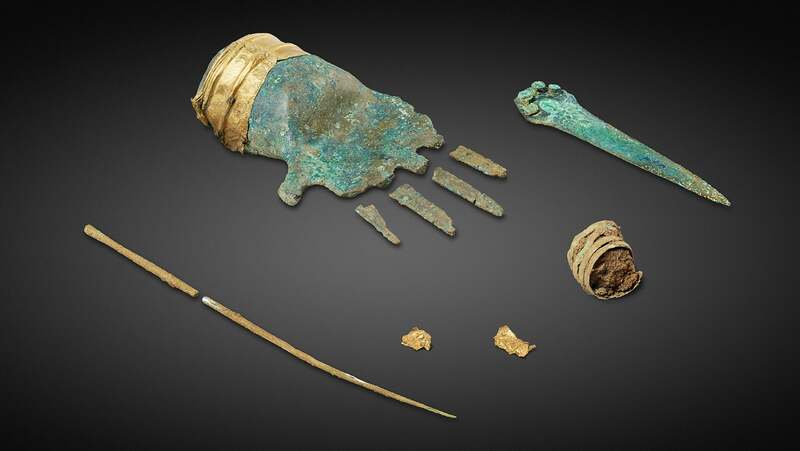 The bronze hand and its thin gold cuff, along with a bronze dagger and a human rib bone, were discovered by the metal detectorists near Lake Biel in the Bernese Jura, about 45km northwest of Bern, Switzerland, according to a Canton de Bern press release. The items were handed over to specialists at the Ancient History and Roman Archaeology Department in the Bern Archaeological Service one day after the discovery. The hand of Prêles, as it’s now called, is slightly smaller than an adult hand and was cast from about half a kilogram of bronze, according to National Geographic. Radiocarbon dating of the organic, vegetable-based glue used to adhere the gold band to the hand’s wrist places the artefact to between 1400 and 1500 BC, back during Europe’s Middle Bronze Age. The archaeologists studying the hand, a team led by Andrea Schae, say it’s doubtful the hand was worn; a socket inside the hand suggests it was mounted on a staff of some kind. 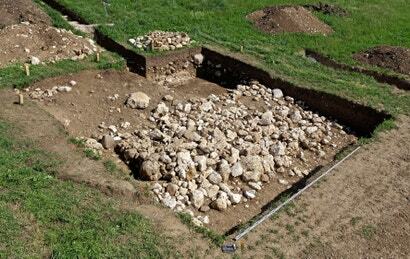 Schae’s team returned to the site in the Bernese Jura to conduct further excavations. They discovered that a grave, possibly a tomb, that unfortunately “had suffered significant damage as a result of recent work,” write the researchers in the release. Indeed, there may be something untoward going on here. SwissInfo reports that there are indications that some objects were stolen from the site. A spokesperson for the Canton Archaeological Service of Bern confirmed to Gizmodo that “a criminal investigation is currently underway in this matter”, and that because of this, they “cannot give more detailed information”. 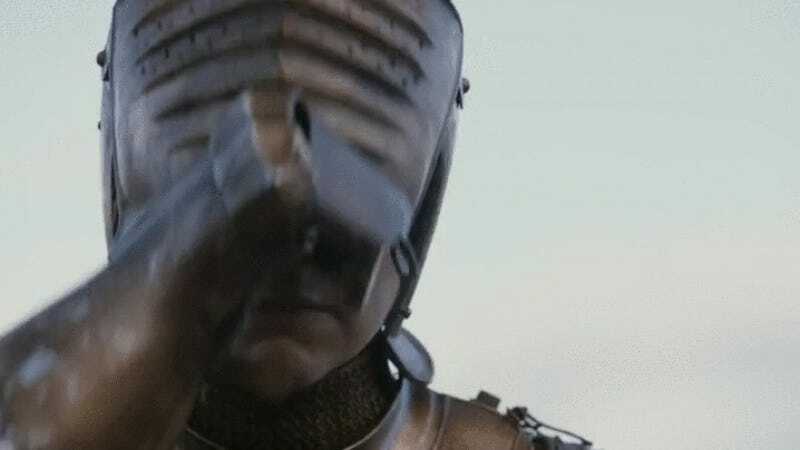 Despite this, the researchers managed to uncover more items at the site, including the bones of a middle-aged male, a long bronze pin, a bronze spiral likely worn as a hair ornament, more bits of gold foil (likely from the hand), and one of the sculpture’s missing fingers. The archaeologists say the hand was likely buried with the man, of whom we know virtually nothing. Beneath the grave, the researchers uncovered a stone-based structure. Apparently, “the man and the bronze hand were deliberately buried over this older construction,” write the researchers in the press release. “He must have been a high-ranking character.” This is an exceptional Swiss Bronze Age burial, one with no precedent. As far as the archaeologists can tell, the bronze hand is unique. A formal research paper to describe the findings is forthcoming, but the researchers are still trying to figure out if the items were manufactured nearby or imported from afar. They’re also struggling to understand the purpose of the sculpted bronze hand. Sadly, this analysis is being complicated by the disturbed condition of the site; the researchers never had an opportunity to observe the grave in situ, that is, in its original, unperturbed state. There’s a lesson here: If you’re a so-called treasure hunter, or a person who’s accidentally stumbled upon something of archaeological significance, stop what you’re doing and call in the experts. Failure to do so means you’re just looting — and destroying history.